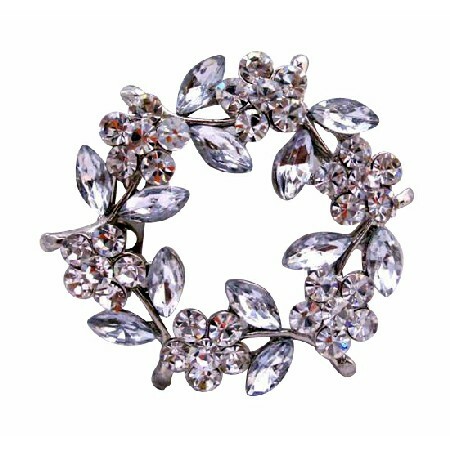 This brooch can ideally glam up all your attires, be it a dress, scarf or a jacket. The flowers and the leaves in the brooch are formed with cubic zircons that gives a diamond like look to the piece of jewelry. A beautiful accessory for any occasion. Secures with a standard pin clasp. A great gift set idea or an addition to your jewelry box collection. Pretty & feminine describes this vintage Brooch with Good quality of Crystals & it is Glorious Pin Brooch crafted brilliantly. Buy Simulated Diamond Flower Brooch Pin with Enamel White Leaves, sold & shipped by Fashion Jewelry For Everyone where you can shop online for Leading Online Retailer for Indian Fashion Jewelry. This Brooch, Pins & Bands collection has been tagged as brooch, pins, accessories, bridal decoration, cake decoration.